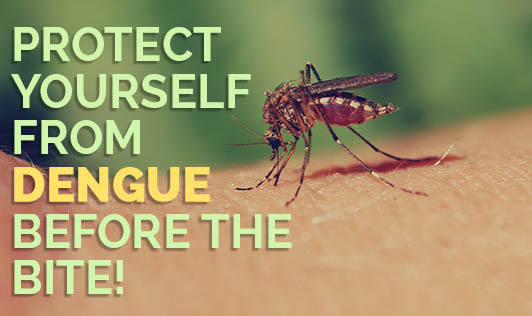 Protect Yourself From Dengue Before The Bite! Our country is in the grip of the Dengue fever, and the number of cases and deaths has been rising in every state. Our news channels have been flooded with these new cases and the government has made efforts to put an end to this. Dengue is not just affecting the rural population; a number of people in the urban areas have also reported being attacked by the fever. The increased number of cases of this fever is most likely due to stagnating waters in the city, unhygienic dumping of garbage, and disposal of waste in open areas. We don't have to go far away to get a glimpse of this reality. Every second street in the city has been littered and this has left a happy breeding space for mosquitoes. Overturn containers that could collect water. Most containers left open outside your home or workplace can collect rain water and serve as a home for mosquitoes to breed. If your home or workplace has flower vases, make sure the water is replaced every day, as the water can harbor mosquito eggs. Wash the vases well as there may be eggs sitting on the surface. If you have pots at home or at your work place, overturn the soil at least every two days to prevent water from stagnating on top of the soil. Make sure that the gutters near your home and workplace or the roof gutters do not accumulate water. Any small stagnant water body can serve as a breeding ground for mosquitoes. Use a mosquito net over your bed at night, or you could use them to cover your windows. If you are working outdoors, make sure you wear clothes that cover your legs and hands well. You could use an insect repellent on your skin if you are going to be outside in the morning or in the evening. Most of them contain DEET as the active ingredient and can also be applied to your clothing. Make sure the air conditioner tray at home and work are cleaned and the collected water is discarded daily. You could use insecticides in roof gutters and stagnant water prone spaces to avoid mosquitoes from breeding. Use a mosquito repellent at home and your workplace. A mixture of juices- Tulsi and ginger along with some honey taken in the mornings can boost your immunity. Pomegranate, sapodilla, orange, and apple contain natural ingredients that can protect you from the fever. The juice of raw papaya leaves has certain properties that can boost your immunity. Dengue fever is becoming a serious concern in the country. It has claimed a number of deaths and has brought the government to take some drastic steps to spread awareness about this fever. We hope this piece of information has given you some simple tips to keep the mosquitoes out of your way.